Ferguson Documents: How The Grand Jury Reached A Decision : The Two-Way The grand jury was presented with hours of testimony and thousands of pages of documents. Their job was to decide if there was enough probable cause to bring charges against officer Darren Wilson. 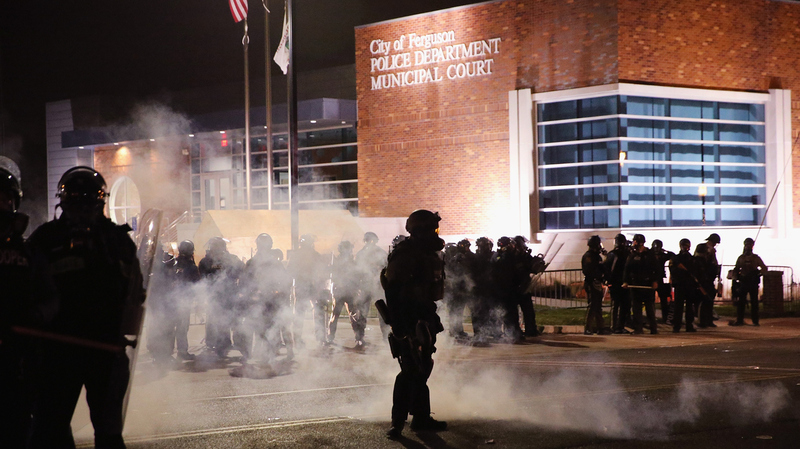 Police guard the Ferguson police department as rioting erupts following the grand jury announcement in the Michael Brown case on Monday in Ferguson, Mo. "The duty of the grand jury is to separate fact and fiction," the prosecuting attorney, Robert McCulloch, said in a televised address Monday night. After weighing the evidence, the grand jury decided that Wilson acted within the limits of the lethal-force law. To issue an indictment, the jury needed at least 9 members to vote for it. In a rare move and in an attempt to allay concerns about bias, McCulloch made public the mountain of evidence presented to the grand jury. We're combing through the thousands of pages — including testimony from Wilson and many witnesses — and throughout the day, we'll update this post with the pieces that help explain how the jury reached its decision. Leading up to this decision, witness testimony has been hotly debated — so much so that the symbol of this story has become protesters raising their hands, symbolically telling police, "Hands up, don't shoot." We have documents of dozens of witness interviews. If you listened to McCulloch last night, much of this jury's decision came down to whether Brown was charging Wilson or surrendering or running away. As we've detailed in another post, it's really complicated. Some witnesses say Wilson started shooting after he got out of the car; some say he started shooting inside the car. Some say Brown was very clearly surrendering, others say it didn't look like he had been hit at all. "[Brown] was to me, and I'm going to say it, he was executed," the witness said. "[Wilson] had made up his mind he was going to kill him." That was the witness' conclusion — that as Brown was shot, he was surrendering, he had his hands up. That's what the witness told local authorities. But when the feds interviewed Witness 14 and drilled down on the details, the witness' assumptions became less clear. Were Brown's hands a sign of surrender? Or was he checking his injuries? Were his palms facing the officer or facing Brown? Wilson is 6 feet, 4 inches tall and weighs about 210 pounds. Brown was an inch taller and weighed about 290 pounds. The officer said Brown and his associate, Dorian Johnson, were walking in the middle of the street, preventing normal traffic from passing. He said he told them to move to the sidewalk, and after a brief exchange Brown used a vulgarity at him. Wilson said he called for backup and tried open the door of his police car. Brown, he said, slammed the door shut. They struggled and Brown hit him in the face twice, Wilson said. He said he thought, "What do I do to not get beaten inside my car?" Wilson said he had considered using Mace, his baton and his flashlight before drawing his gun and telling Brown, "Get back or I'm going to shoot you." Brown then grabbed his gun, Wilson said, and twisted it and dug it down into the officer's hip. The officer said he feared he would die if Brown got hold of the gun. He said he managed to raise the gun and fired twice. It just clicked. But the third time, the gun went off, startling both men. That's when, Wilson said, Brown looked up at him "and had the most intense aggressive face. The only way I can describe it, it looks like a demon, that's how angry he looked. He comes back towards me again with his hands up." Wilson said he tried firing again but nothing happened. When he tried once more, it went off. Brown then hit him again, he said. The officer said that when he looked up, Brown was running away. Wilson said he got out of the car, called for backup and began chasing Brown. He said Brown then stopped and he did, too. He said he ordered Brown to get on the ground, but the 18-year-old did not. He said Brown made an "aggravated sound" and ran back toward him. He said he warned Brown repeatedly to get on the ground, but when he did not comply the officer fired "a series of shots." "I don't know how many I shot, I just know I shot it," he said. Wilson then proceeded to explain his rationale for why he chased Brown. He said he wanted to keep Brown "contained" until support arrived. He said he thought that if he could buy 30 seconds of time, until other officers arrived, they could "make the arrest, nothing happens, we are all good." "And it didn't happen that way," Wilson said. One really important part of this case is of course the physical evidence. We've gone into more details in a separate post. There are two findings of major importance: First, the autopsy found that Michael Brown was never shot in the back, as some early witnesses claimed. Second, they found Brown's blood inside the police car and on Wilson's gun. This implies that there was close-range contact as Wilson alleges. We've also posted the photographs taken of Wilson on the day of the confrontation. Doctors diagnosed him with a bruise. That seems to cast some doubt on Wilson's testimony about the intensity of the confrontation. We've uploaded most of the documents we received from prosecutors. We invite you to look through them and tip us off to anything you find interesting in the comments. An earlier version of this post said at least nine members of the grand jury found Wilson acted within the law. That's not necessarily the case. All we know for certain is that the jury needed nine members to believe there was probable cause to hand down an indictment. The jury did not meet that threshold.